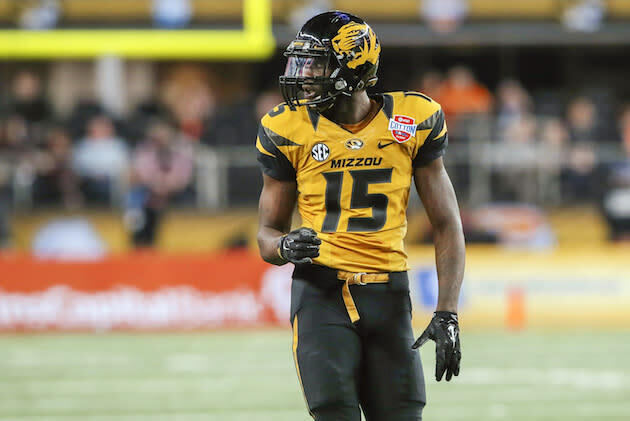 Missouri WR Dorial Green-Beckham was arrested on Friday in his hometown of Springfield, Mo. on drug charges. However, he was released from the Greene County Jail without formal charges being filed. Green-Beckham and two others were arrested before 10 p.m. Friday evening. The 20-year-old sophomore Springfield native and former Hillcrest High School star was booked on an initial charge of possession with intent to distribute a controlled substance after marijuana was found during a traffic stop, according to the Springfield police. John W. McDaniel, 22, and Patrick Prouty, 20, were the other two men arrested with Green-Beckham. A spokesperson for the Springfield Police Department told the St. Louis Post-Dispatch that “It’s an ongoing investigation and we’re not going to comment now on the situation.” Missouri spokesperson Chad Moeller told the Post-Dispatch that the school was aware of the situation. Green-Beckham was the No. 1 recruit in the class of 2012. He was suspended for a game as a freshman after he was arrested with two other teammates on suspicion of marijuana possession in the parking lot outside of Missouri's Memorial Stadium in October 2012. In that matter, he pled guilty to a reduced charge of trespassing. As a sophomore this season, Green-Beckham had 59 catches for 883 yards and 12 touchdowns. His best game of the season came against Kentucky when he had seven catches for 100 yards and four scores.